Covey Film Festival – Entertain. Engage. Educate. But First...Two Spring Tuesday Pop Ups! During the early days of World War II, the fate of Western Europe hangs on the newly-appointed British Prime Minister Winston Churchill who must decide whether to negotiate with Adolf Hitler or carry on the fight against incredible odds. Darkest Hour received eight 2018 Academy Award nominations including two winners: Best Actor, (Gary Oldman) and Best MakeUp. Join us at 6PM for a tour of a real bomb shelter, an exciting WWII exhibit, and period cocktails and bites. Jane will Skype in from LA to talk to the audience and answer questions. The Covey Film Festival is not just an opportunity to sit down and eat popcorn while watching the big screen. It acknowledges that film is now recognized as a major cultural visual art form in the same league as dance, theatre, and fine art. Thomasville is unique in the film industry due to its involvement in film production as well as the number of people with ties to the area currently active in the film world. The Festival itself is a vehicle to entertain, educate and engage audiences through the screening of over twenty acclaimed films—in addidtion to special events and pop-ups—during Covey’s sixth season in October. 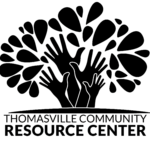 The Festival is also the signature fundraising event for the Thomasville Community Resource Center which for twenty years has provided services to children, their families, and the community. All net proceeds return to TCRC for services (like the STEAM—science, technology, engineering, arts, math—program) for 500 children and their parents in ten sites in Thomas, Mitchell, and Grady Counties. To learn more about TCRC, click the logo below. We deeply regret that all 2018 scheduled films could not be shown due to preparations for Hurricane Michael and its impact on the community which extended beyond our control. The Covey Film Festival is an exciting time in October—dozens of films and film-related events are scattered around picturesque Thomasville during the first cool nips of Fall. But did you know that Covey continues throughout the year with pop-ups and special occasions? By becoming a part of the Covey family, you'll receive announcements, special deals, and the first heads-up on the good things we do. Whether an individual who wants to make a serious difference in our South Georgia community or a business involved in the changing area economics, support for the Covey Film Festival is worthwhile. Underwriting opportunities for individuals and families to change the lives of hundreds of area children. Receive video spots, marketing, and visible social networking with Gala/Auction tables for your business. Your unecessary extras could be just the thing we’re looking for. Check out our wish list. There's always something happening with the South Georgia-related actors, directors, films, and locations.